INFOhio and the Management Council support personalized learning and encourage districts to pursue the Future Ready Ohio vision. The Are You Ready? blog series will help school and district leaders—superintendents, principals, tech integration specialists and coaches, and teachers and librarians—identify the INFOhio resources, tools, content, and features that contribute to the Future Ready Framework and enable alignment with the goals established by the framework's assessments and guidelines. Each post in the series will address how INFOhio supports student learning by explaining how our content aligns with and supports the individual gears of the framework: Collaborative Leadership, Budget & Resources, Use of Space & Time, Curriculum, Instruction, & Assessment, Robust Infrastructure, Data & Privacy, Community Partnerships, and Personalized Professional Learning. INFOhio and the Management Council support personalized learning and encourage districts to pursue the Future Ready Ohio vision. The Are You Ready? blog series will help school and district leaders- superintendents, principals, tech integration specialists and coaches, and teachers and librarians-identify the INFOhio resources, tools, content, and features that contribute to the Future Ready Framework and enable alignment with the goals established by the framework's assessments and guidelines. Each post in the series will address how INFOhio supports student learning by explaining how our content aligns with and supports the individual gears of the framework: Collaborative Leadership, Budget & Resources, Use of Space & Time, Curriculum, Instruction, & Assessment, Robust Infrastructure, Data & Privacy, Community Partnerships, and Personalized Professional Learning. INFOhio and the Management Council support personalized learning and encourage districts to pursue the Future Ready Ohio vision. The Are You Ready? blog series will help school and district leaders-superintendents, principals, tech integration specialists and coaches, and teachers and librarians-identify the INFOhio resources, tools, content, and features that contribute to the Future Ready Framework. These posts serve to foster district alignment with the goals established by the framework's assessments and guidelines. Each post in the series will address how INFOhio supports student learning by explaining how our content aligns with and supports the individual gears of the framework: Collaborative Leadership, Budget & Resources, Use of Space & Time, Curriculum, Instruction, & Assessment, Robust Infrastructure, Data & Privacy, Community Partnerships, and Personalized Professional Learning. It's Autumn—cooler temperatures, shorter days, crisper air, and yes, runnier noses. It's a great time to teach your little learners about the change of seasons and how they affect the world around them. Check out these resources and tips from INFOhio to help teach your PreK-3 students about Autumn. Using digital text and tools is a way to engage readers in text, as well as empower them with one of the most critical needs for their future—digital literacy. INFOhio is dedicated to providing high-quality digital content, resources, and tools for students and teachers in Ohio that will develop the necessary skills for early literacy, inquiry, and college and career readiness. Today's digital natives are primarily "tech comfy." Teens may need to show adults how to use SnapChat, but age and experience help adults know more about how to evaluate the content on this platform and other digital spaces. Mission Control: Prepare to Launch! Many educators across the state are in full blast-off mode - you are creating lesson plans, changing student seating, and maybe even grading papers. But this post will ask you to take a step back, and think about how you get ready to launch your students' learning. This post is about the motivation for your 12 hour, no bathroom break, opening ketchup packet days - this is Mission Control. INFOhio's quality resources, tools, and professional development can help you in your mission. Here are 8 ways to use INFOhio to help launch student learning. 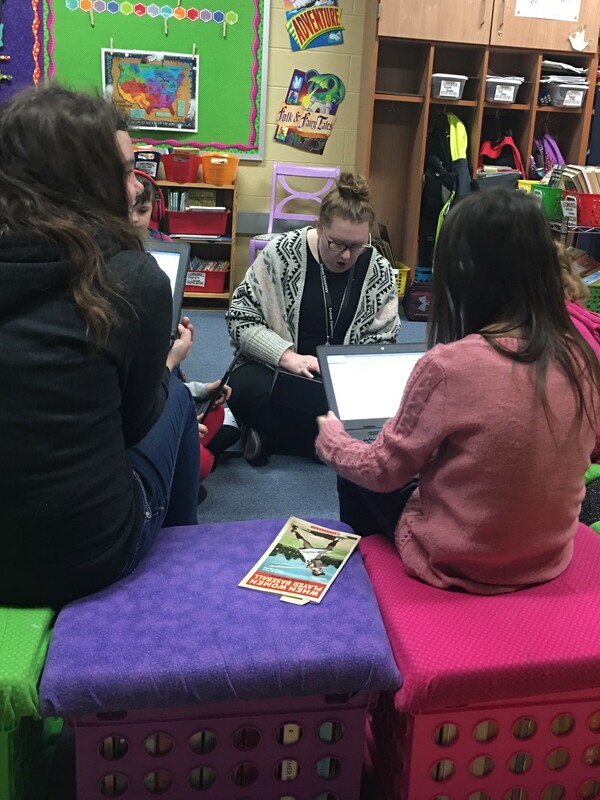 Friday's post on how to keep calm, cool, and collected during the last days of school provided an example of how to implement Camp INFOhio into your classroom during the last weeks before summer break. The goal is to keep kids engaged, learning, and interested. Another resource available at no cost from INFOhio is IWonder. This student site is a collection of websites chosen by educators. The sites are categorized by asking students questions such as "Do You Want to Learn More About Technology?" and "Do You Want Help with a Project?" Students can browse to find a topic that interests them, and drill down to find specific websites where they can learn, play, and explore. Of course, one way to achieve part of the goal set is to allow the students to do just that—browse to learn, play, and explore. Without a plan of action, however, students may not be as engaged. And without engagement, well, we all know what happens in a classroom where students are not actively invested and interested! The classroom is packed up, with bare walls and stacked-up textbooks. Students are eager to help clean and sort, preparing for the end of the school year. The teacher frantically finds activities to keep the class busy, and when all else fails, turns to a movie, the lights turned off, the room cooler without a fluorescent glare. Tomorrow is Field Day, and the temperature is sure to be high. The next day is the class picnic, and after that, the doors close for good on this school year. It's amazing to think that it is April, and for many Ohio teachers, there are only 6-8 weeks left of this school year. Most can still remember the smell of the new crayons or the smiling faces of new students. Many will wonder where the school year has gone. Most will cheer and dream of peace, sleeping in, and sunshine. And because it is April, many educators will also begin to wonder what they can do to further their efficacy, effort, and influence in the classroom for the next school year. They will think back about this year, and ask, "How can I engage my students more?" What approach might work better for teaching this concept?" "Should I consider restructuring my reading program?" That's right—the end of the school year often means it's time for some serious professional development. "Summer is the perfect time to recharge," according this to this article from Educational Leadership about ways that being a better student will lead to being a better teacher. Often districts will have prescribed summer PD, but that doesn't mean there aren't easy options for developing your own PD plan—one that will answer your personal questions and build a better educator based on your needs and expectations. INFOhio can help with that. We like to think of it as Summer Reading—Teacher Style. It's free and all you need is time, some mindfulness, and a device with an Internet connection. Do you use Scholastic News in your classroom? What about Scholastic Scope or Scholastic Science? These subscriptions are a popular teaching tool in many schools. Full of informational text and critical thinking activities, Scholastic's classroom magazines offer teachers a wealth of resources that feature popular topics and engaging graphics. You can learn more about these resources, their grade levels, and content at Scholastic's Classroom Magazines site. With Valentine's Day approaching, it's a great time to talk to your elementary students about all kinds of healthy emotions and feelings, and treating others with kindness and respect. Use the entire week of Valentine's Day to boost your students' social and emotional learning. A recent emphasis on social and emotional learning may be related to language in the Every Student Succeeds Act that makes provisions for schools to count social and emotional growth toward their improvement strategies. PDFs to put POW! in your Pedagogy! Using graphics to support learning is a strategy proven to have maximum results for student learning in classrooms. According to the National Council for Teacher Quality in a recent study, Learning about Learning, "Young or old, all of us receive information through two primary pathways - auditory (for the spoken word) and visual (for the written and graphic or pictorial representation). Student learning increases when teachers convey new material through both." Not only should teachers pair words with graphics, they should also provide concrete and tangible examples for abstract ideas. These are two strategies identified as, "proven practices that improve learning for all students." Using PDFs from INFOhio's Explora database is one way to integrate images and concrete examples into your classroom.